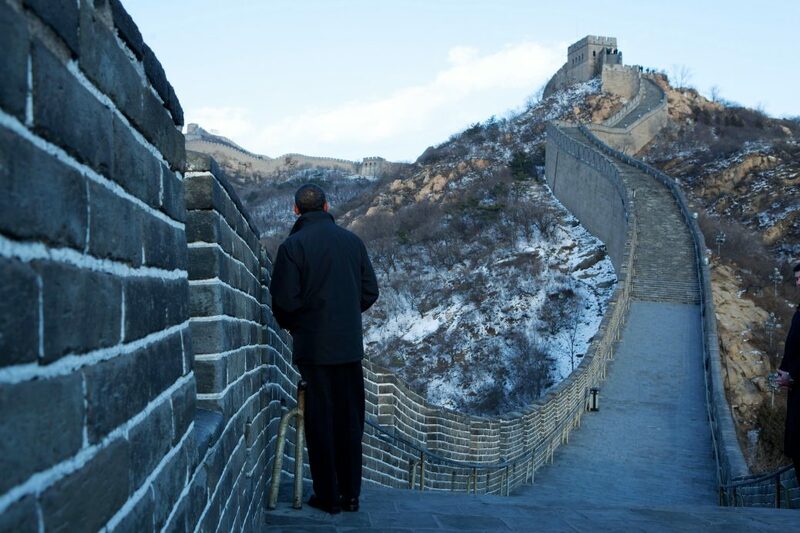 President Barack Obama tours the Great Wall in Badaling, China, Nov. 18, 2009. (Official White House Photo by Pete Souza) This official White House photograph is being made available only for publication by news organizations and/or for personal use printing by the subject(s) of the photograph. The photograph may not be manipulated in any way and may not be used in commercial or political materials, advertisements, emails, products, promotions that in any way suggests approval or endorsement of the President, the First Family, or the White House. I admire those whose aptitudes and skills build the kinds of things that are useful and in many instances things of beauty as well as functionality. Walls are such things. Laid on a solid, prepared foundation, walls are the exoskeletons of buildings, the lines of separation of property, the security enabling structures that keep the good folks and the bad folks apart. Beyond the physical manifestations of our never ending need to build, there are walls that are erected in philosophy, manipulation of truth, establishment of law, rule and regulation. Walls can be punitive, restorative or privacy protecting at their simplest. As much as they require the steady hand and the straight line, they can be used by the most crooked of people and the most shady of characters to build what they need to steal from the people and render freedoms crushed and laid waste to. The Berlin Wall ran down the middle of a city and created an eastern bloc and a western bloc. This line of demarcation caused the separation of families for generations, saw the deaths of hundreds of those who were headed in one direction only – from repression to freedom. Those that died in their valiant attempts to gain freedom should be remembered even after the wall has come down physically because the mental, societal and philosophical wall remains erect and as foreboding today as its physical presence was in a preceding era. Today we have a wall builder in Washington, whose craftmanship is seen in the long term of the planning, the careful establishment of the foundations and then the brick by brick building of the wall itself. This wall is not physical, but it is as solid as any mortar and stone construction we have ever seen. What holds this wall together is the complicity of the former “truth tellers”, “the fifth estate”, the investigative reporters”, whose glory days of bravery, digging deep for the truth are long gone. Those days have been relegated to the dusty shelves of the memory of those who would not allow a lie to stand and boldly stood tall, often alone against the prevailing trend or the mantra of deception in its popularity. Now we have a press that is on speed dial to the controllers who inform the media of the fictions that they are to tell the public. The patterns are easy to see and all you have to do is look to the overpaid talking heads in print, broadcast, and internet media to discover the commonalities in speech and verbiage and lies. They are strangely consistent. You would almost think that a plan is being executed against the truth and in favor of the rulers of “We, the People”. Yesterday and today we witnessed the President on his socialist platform putting another brick in the wall of gun seizure and freedom grabbing. The mortar is put in place by his assistants in the media and he puts the next brick in position to enclose the freedoms of the people in the maze of lies and spin with which he speaks and controls the narrative. When a muslim murders and praises his god as he does so, it takes a bold gesture of affirmation to deny the truth of what he is. Obama has done it again. The truth is denied and the focus is what he wills it to be. Hate and guns……not islam and enablement, are to blame, according to the man with a mission. But there are cracks in the wall of Bathhouse Barry’s making, big enough to let the light of truth shine through. A wise man once said, “you can fool all the people some of the time”……but….